Senior leaders from business, government, the UN system and civil society kicked off the event by spending time browsing and interacting with the eight exciting innovations featured in the Innovation Showcase. Innovations included: Huawei’s telemedicine and health data management collaboration which aims to transform health outcomes in North East Kenya though use of IT and connectivity; the Sayana® Press injectable contraceptive from Pfizer, which dramatically simplifies the delivery and cost of long-lasting contraception to women in under-resourced areas; GE Foundation’s Hewa Tele business model for sustainable delivery of oxygen to children suffering from pneumonia in Rwanda, Kenya and Tanzania; Tigo Ghana’s mobile-enabled birth registration project, entitled mBirth; the Ifakara Health Institute’s repellent-treated sandals against vector borne diseases which have been demonstrated to reduce mosquito bites by up to 77% in Tanzania; a Mobile Obstetrics Monitoring Telehealth Service from Philips which enables better diagnosis of pregnancy-related complications in Indonesia, and LIXIL-American Standard’s SaTo Latrine Pan, an affordable and hygienic infrastructure for pit latrines. During the showcase the EWEC-ViiV Positive Action USD 100 000 prize on Empowering Girls in Emergency Settings (EmGemS) was awarded to Ayzh and Circle of Health International for their admirable work promoting safe birth and menstrual hygiene for refugees in Syria and Sierra Leone. Ms Susana Fried, Board Member of ViiV’s Positive Action, presents EmGemS award to Colleen Lyons of Ayzh and Sera Bonds of COHI. Opening remarks during the event were delivered by Dr. David Nabarro, Special Advisor to the UN Secretary-General on the 2030 Agenda for Sustainable Development and Climate Change, and Ms. Kathy Calvin, President and CEO of the UN Foundation, who emphasized the essential role of the private sector in driving the success of the SDGs and the importance of partnerships and collaboration. Dr. Nabarro highlighted the importance of supporting and scaling life-saving innovations. His Excellency President John Mahama Dramani of Ghana delivered keynote remarks, underlining the centrality of ICT technology in helping developing countries to advance progress under the SDGs. In particular, President Dramani noted the role that mobile telephony is playing in empowering citizens—especially young people and women—through education, financial inclusion and health initiatives. During the brief panel discussion, moderated by Dr. Peter Singer, Co-Chair of the Every Woman Every Child Innovation Marketplace, participants were able to hear about some of the challenges in scaling health innovations on the ground. Minister Tedros Adhanom, Ministry of Foreign Affairs of Ethiopia, spoke of the importance of country planning and leadership, while Mr. Ronald de Jong, Chief Market Leader and Member of the Executive Committee of Philips acknowledged that scaling requires a full ecosystem and partnerships across sectors. Ms. Elizabeth Scharpf, Founder and CEO of Sustainable Health Enterprises shared her experience in innovating and scaling the manufacture and distribution of affordable sanitary pads for menstrual hygiene in Rwanda, working in collaboration with government and business; while Mr. Mats Granryd, Director-General of GSMA and Ms. Elisabeth Medou, CEO of Orange Cameroun spoke to the transformative impact that mobile telephony initiatives are having on women and girls globally and in specific markets. An important point made during the panel was on the importance of including youth in all endeavors, and of letting go of biases to recognize and invest in promising innovations no matter where or from whom they emerge. 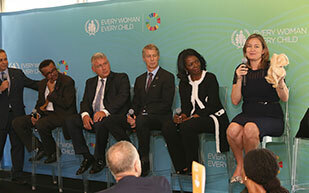 The event was closed by Ms. Susan Myers, Senior Vice-President at the UN Foundation, who acknowledged the continued and growing energy in relation to innovation and private sector in the Every Woman Every Child movement, and the importance of partnerships and collaboration in making an impact. For further news on Every Woman Every Child and private sector commitments pledged during UNGA 2016 please go to this link.